While incomes have gone up and poverty has gone down, the drop in the share of households receiving food stamps in 2015 has been less significant. Although incomes have been rising and poverty declining in Texas, there's been less change in the share of households relying on food stamps, new U.S. Census data shows. In 2015, 12.5 percent of Texas households used the program, down from 13.1 percent in 2014. The drop of about 43,000 households was less significant than the overall drops in individual and household poverty from 2014 to 2015. The disparity underscores that economic recovery has not reached all poor people and that the need for food assistance is not limited to those living in poverty, nutrition advocates and researchers said. People facing the most dire financial circumstances are “probably the ones whose boats are last to rise,” said Celia Cole, CEO of Feeding Texas. “Just the fact that people are on SNAP over the poverty line is an indicator that even over the poverty line people aren’t earning enough to feed their families,” Cole added. 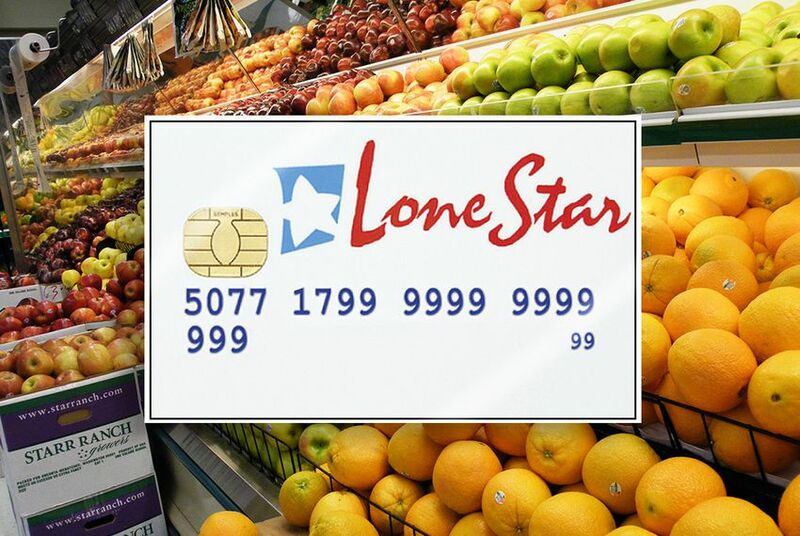 The Supplemental Nutrition Assistance Program, or SNAP, provides assistance to almost 1.2 million Texas households through Lone Star cards that can be used like credit cards at stores that accept food stamps. The need for food stamps increased significantly during the 2008 economic recession. But as the economy has recovered, SNAP rolls have been slow to fall both nationally and in Texas. The share of Texas households on food stamps peaked at 14.3 percent in 2012 — up from 9.5 percent in 2008. By contrast, the share of households below the official poverty line has dropped slightly below 2008 level. “Just having people move out of poverty isn’t necessarily moving” people out of the income eligibility range for SNAP, said state demographer Lloyd Potter. In fact, only about half of households receiving food stamps were below the poverty level in 2015. A family of four would generally need to make $40,104 or less now to qualify for food stamps. By contrast, a family of four with two children would be classified as poor if their income is less than $24,036. The median household income in Texas last year was $55,653 — up almost 5 percent from 2014. While the median household income for households on food stamps also increased, it was much lower: $22,488. Additionally, some areas of the state didn’t see people move out of poverty despite overall economic gains. Roughly a third of the state’s 25 metropolitan areas actually saw their poverty rates increase in 2015, and the share of people living in poverty in more than half of the state’s metro areas surpassed the state average. South Texas metro areas, which are predominantly Hispanic, remained among the poorest areas of the state, with poverty rates double the state figure. Half of the Texas households that received food stamps in 2015 were considered Hispanic households. Overall, black and Hispanic households were far more likely to receive food stamps than white households. Nutrition advocates are claiming success when it comes to reducing the share of Texas households who live with “food insecurity,” meaning their access to adequate food is limited by lack of money and other resources. In a September report looking at food security in 2015, the U.S. Department of Agriculture placed the food insecurity rate among Texas households at 15.4 percent — down from 17.2 percent the year before. While the prevalence of food insecurity in Texas — along with 11 other states — was higher than the national average, the decline in Texas was more significant than it was nationally, said Kathy Krey, research director for the Texas Hunger Initiative at Baylor University. The decrease is a result of both a drop in poverty and targeted efforts to improve access to food, Krey said, pointing to increased use of a federal nutrition program and other private food resources. Among efforts to improve food access are several pieces of legislation that have increased Texas schools’ participation in summer meals and breakfast programs. Rising incomes helped lift more Texans above the federal poverty level in 2015, new census figures show, but poverty is still particularly prevalent among families with children and on the border.